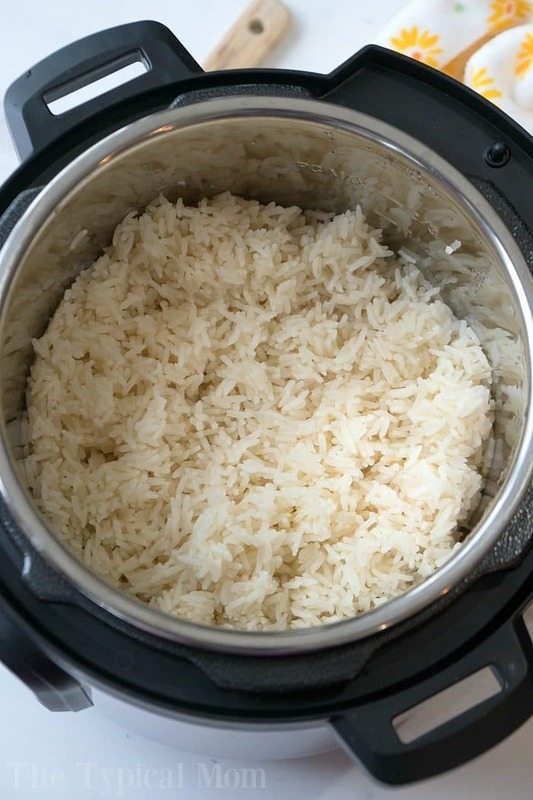 This is how to make the perfect Instant Pot white rice in your pressure cooker. 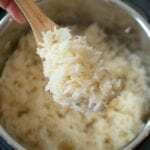 How long to cook it, what liquid to use, and tips on serving the best tasting rice are here. Whether you are a beginner or use your Instant Pot daily this basic recipe will become your go to for dinnertime. I’ve had a rice cooker ever since I was a kid and watched my mom cook it that way night after night. In that it was always a 2:1 ratio of water to rice (it isn’t the same for the IP). She always just used water and I never thought twice about it as a kid. When I got married the first thing I put on my wedding registry was a rice cooker…a big one. That is how engrained white rice is in my life. lol. 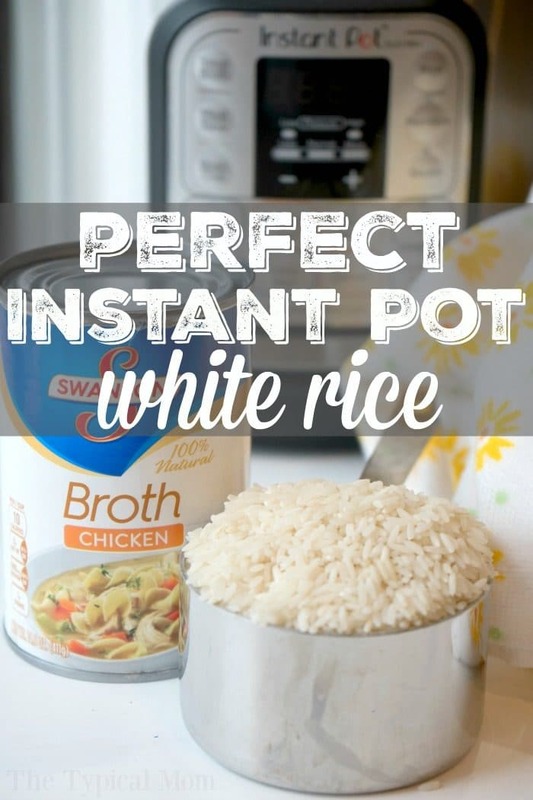 Now I just use this Instant Pot white rice recipe and it’s perfect every time! At first it was a learning curve for sure and I made rice several times before I figured out the perfect rice recipe, then I wrote this post on how to use an Instant Pot to help everyone else out too! 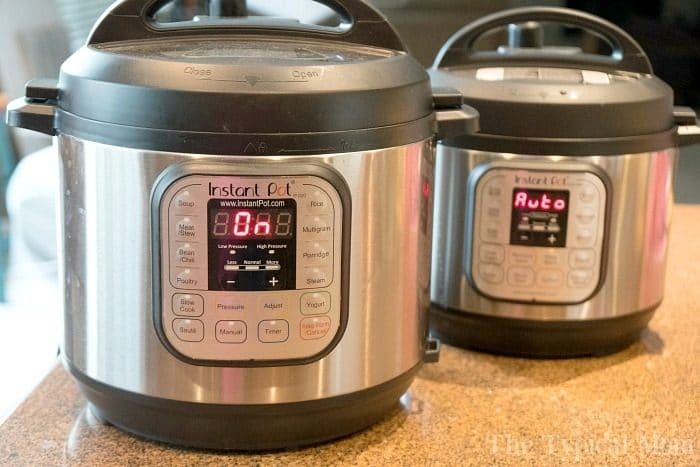 When I had a family and started cooking rice night after night I never thought differently, but once I got my Instant Pot it didn’t turn out quite the same. I made different versions of Instant Pot white rice in order to figure out the exact ratio of liquid to rice I needed. I found that I preferred chicken broth (or a mix of broth and water) much more than plain water because it gave it so much more flavor, and rinsing the rice before putting it in my pressure cooker made it “whiter” than before so I started doing that as well. We make 2 cups of uncooked rice for the 5 of us, you could cut this recipe in half if you needed to. I got tired of swapping liners, or cooking my rice, emptying the pot, and then cooking my main dish in my Instant Pot so last month I broke down and bought this Instant Pot mini 3 qt. and now I can have the entire dinner done and on the table in under 30 minutes flat…I love it….so worth it! 2 c. uncooked rice + 2 1/2 c. water seems like the perfect ratio for us to make the perfect Instant Pot rice. Not too dry, not mushy. I have a recipe for how to make the perfect quinoa in your Instant Pot here too! Like I said I make my rice now in my Instant Pot mini while my main dish is being cooked in my 6 qt. Instant Pot. I use my Instant Pot almost every night and make something new to add to The Typical Mom every single week. To make this easy Instant Pot white rice recipe you do not need any additional items. However, I HIGHLY suggest you get a non stick pot because it’s 1,000 times easier to clean! I do recommend a few Instant Pot accessories here though that have been helpful overall. ** Note – cook times differ depending on how you like the texture of your rice and your altitude, this timing works well for our tastes. Then you can serve your Instant Pot white rice with a few easy Instant Pot recipes on top! 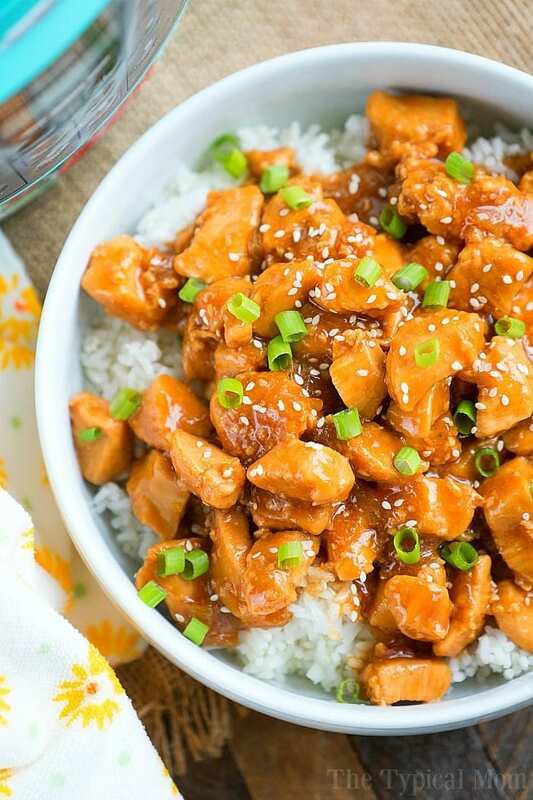 Instant Pot sesame chicken seen above! Use a strainer and rinse your rice. 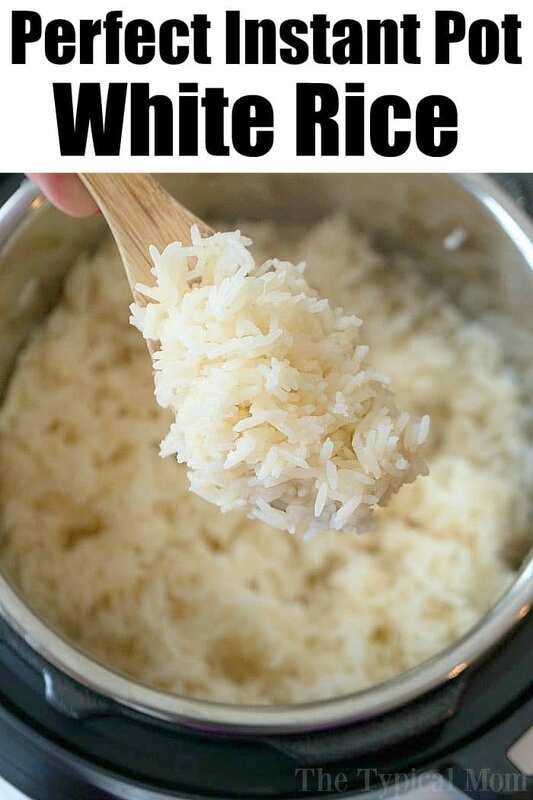 Pour rinsed white rice into your Instant Pot or pressure cooker. Pour water or broth on top of your rice. Close lid and steam valve, push rice button and wait until it beeps when done. Best when served and eaten immediately. Thanks, I have a Air Fryer and Insta Pot , the two of them make my life soooooo easy. Choosing between them would like choosing between children, tonight Shish kebab in the Air Fryer, peas and buttered rice mixed together in Insta Pot. Invest in an Air Fryer you won’t be sorry. You say in the first set of instructions to use 2 1/3 cups of liquid, then in the recipe area it says to use 2 cups of liquid — you may want to edit it so that the instructions are the same in both places. I have a 6 quart Instant Pot, and I make rice in a 1 quart pyrex glass bowl — “pot in pot” style — placed on the trivet with 1 cup of water placed in the bottom of the inner pot (below the trivet). That way, when the rice is done, all you need to do is lift the bowl out, and the inner pot is clean and ready to use for the next thing. This is terrific! Thanks for sharing it and taking the time to explain it so well. Does the time of 20 minutes include time for the pot to come to pressure? That includes prep time so if you take that out yes total cook time would be 20 min including time to pressure.